Let me set the record straight. I’m no conspiracy theorist. But some things make me wonder. The recent release of the confidential Hillsborough Disaster papers is one of those things that makes me mad, and re-inforces my passion as a personal injury lawyer. In the 60’s hippies and protesters used to have a slogan “Don’t trust anyone over 30“. The slogan highlighted the generational gap, and the ideological differences between parents, grandparents and their children. For me, this sort of slogan drove home the point not top trust our leaders, or those who control the reigns of power. At that time, the younger hippies and protesters weren’t in any sort of positon of power or great wealth. Rather, they felt that their elders (those over 30) held those positons of power, authority and wealth. They felt the socio-political system in which they were operating was tilted to serve the interests of the older generation and not the new generation. This reached its climax with the Vietnam War. So, how does all of this political science mumbo jumbo relate back to the field of Personal Injury Law? Good question. Yesterday, British Police released the confidential documents from the Hillsborough Disaster. The Hillsborough Disaster is one of the largest (non-war/terrorism related) wrongful death tragedies from the 1980’s. It took place on April 15, 1989 when fans from Liverpool FC and Nottingham Forrest attended at Hillsborough Stadium in Sheffield England for the FA Cup Soccer Semi-Final. For you non-soccer fans, the FA Cup was a pretty big deal back then. The teams agreed to have the semi-final played at a neutral site stadium and Sheffield got the nod. What happened next is a tragedy of epic proportions involving broken bones, anoxic brain injury, and massive crush wounds causing death. The Nottinham Forrest fans were put on the larger end of the stadium, despite the fact that Liverpool was a larger club with more fans. It was clear to police that the Liverpool end was overcrowded with people. Instead of stopping the flow of people into the Liverpool end, the police opened another tunnel to allow more fans into the Liverpool end of the stadium. They opened additional pens to house the fans close to a fence (which is called a crush barrier at old English soccer stadiums). Fans began to pile on top of each other at the base of the fence. As more fans entered, more and more fans were crushed on top of each other below at the base of the crush barrier. The crush barrier eventually gave way and collapsed because the stadium could not accomodate the influx of fans in the Liverpool section. The result was 766 injuries and 98 wrongful deaths! 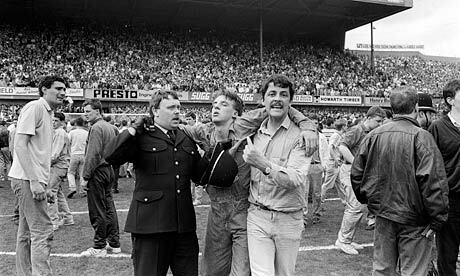 A full scale police investigation was launched into the Hillsborough Disaster. Hundreds of police gave statements testifying that the Liverpool fans were drunk, unruly, and antagonized police. The Taylor Report concluded that the main reason for the deaths was the failure by the police to control the crowd and the influx of fans. The Taylor Report had some positives. It completely ended the use of standing terraces at all English, Scottish and Welsh Football stadiums to prevent this sort of mass tort. Yesterday, police disclosed confidential papers which had not been disclosed ever before. The papers revealed that the police knew that the stadium posed a security threat and a crowd control hazard for the game, long before the game ever took place. Can you say cover up? The Prime Minister of Britain, along with the English Soccer Association apologized immediately. Had the authorities disclosed of the security and crowd control issues before the game took place, 766 people would not have been injured, and 98 people would not have died cheering on the soccer team they love. This was a mass tort of epic proportions. It’s the sort of case designed for class action litigation. Now that the papers have been revealed that police knew or ought to have known of the safety threat, I wouldn’t be surprised if personal injuries lawyers across Britain didn’t try to re-open this case and recover additional compensation on behalf of accident victims and their families. An award of punitive or aggravated damages would surely be worthy is such a case. That’s why we have punitive and aggravated damages in the first place. So, are cover ups just a British soccer thing, or do they happen in other areas? Yes, they do. As an accident lawyer, we see more frequently than you’d like police omitting information, or not disclosing it. Ask a criminal lawyer about their disclosure issues. They’ll be able to go on for a long time telling you about the problems getting information, or lack thereof from the authorities. The same thing happens in car accident cases, assault claims and bike accident claims. So, the next time you get hurt or injured in an accident, take a word from the hippies of old. “Don’t trust anyone over 30”. Get as much information as you can about your case. Conduct your own investigations if you can. Can the name, address, contact information of all of the witnesses yourself. Get your own photos of the accident scene. Because you never know when things will go “missing”, or what information the police might not have caught. The I-Phone 5 was released yesterday. Smaller, faster, thinner, bigger screen. Thoughts? Not sure. All I know is that millions of people are now flocking to Best Buy to purchase the latest greatest gadget on the market. Amazing how Apple can release 2 versions of their I-Phone before RIM can launch their latest Blackberry which was delayed about 1 year. Boy are they in trouble.